This German StuG III Sturmgeschütz Ausf.F/8 Tank Destroyer Sd.Kfz.142/1 is also known as the StuG 40 Ausfuhrug. F/8. the F/8 designation refers to the fact that this version of StuG III Ausf F used the tank chassis ZW/8 (Zugführerwagen version 8) using the hull of a Panzer III tank Ausf J. This example can be found at the Kubinka Tank Museum in Russia. 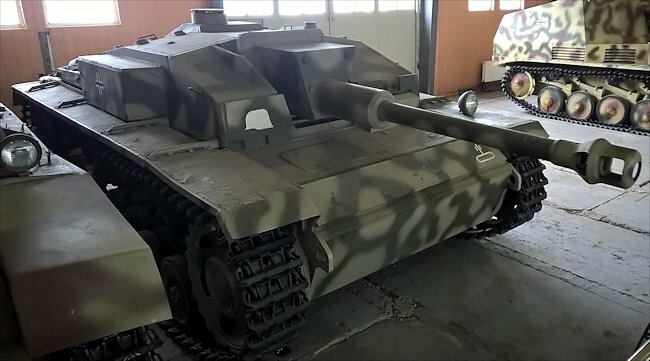 German StuG III Ausf. F/8 at the Kubinka Tank Museum in Russia. The Ausf F model of the StuG III came with the much needed higher velocity 75mm Stu.K 40 L/43 gun that was capable of stopping the new Russian tanks like the T34/85 and the KV-1. It saw the shift in tactical use of the StuG from an infantry support assault gun platform to dedicated tank destroyer. The way to tell the difference between a Ausf F and G is that the Ausf F does not have a large raised Commander's circular cupola. Later versions received an even better gun 75mm Stu.K 40 L/48. 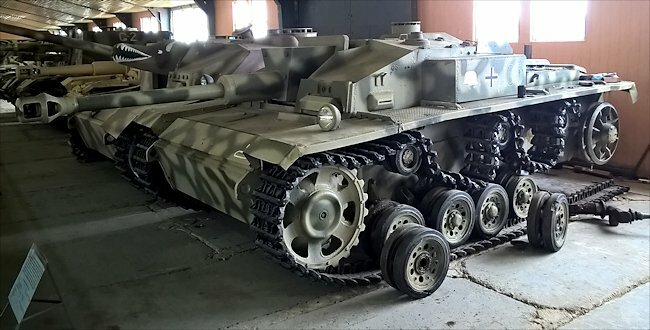 The StuG III Sturmgeschütz Ausf.F/8 Tank Destroyer started to come out of the factory doors in September 1942 and remained in production until December. The factory used the Panzer III Ausf J and L models that had increased rear armour. 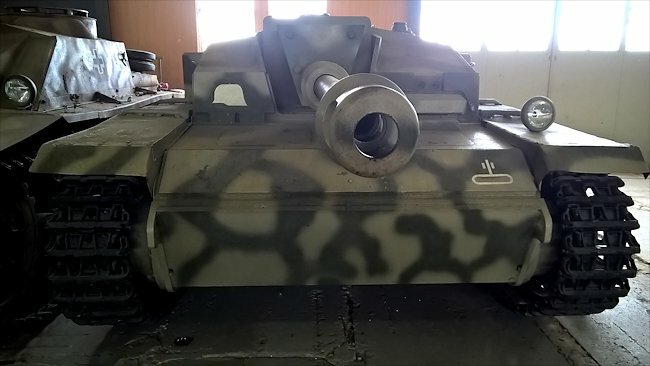 Additional 30mm of armour was added to the front of the Vehicle. They were all armed with the 75mm Stu.K 40 L/48 gun. This is the account of Paul Breslau. He was the gunner of a Sturmgeschutz III self propelled gun with the 200 Assault Gun Battalion, 21st Panzer Division, based in the Caen area south of Sword beach. I mean no insult in the phrase, but it is a fact that the Static Infantry were there to soak up any enemy attack, to slow it down and to alert us, the inland forces, of the danger. Nobody on earth expected the Static Divisions to defeat a serious landing, unless it was a very lightly-equipped raid. I must pay tribute to their commitment and determination, whatever their level of fitness. I believe that they fought very hard, but we must be realistic, and see the facts for what they are. It was accepted by everyone that if there was a real invasion on that coast, and not a commando-type attack with a limited objective, then the beach forces, the coastal forces, would probably be overrun at first by a focused assault. This was why a counterattack by our mobile armoured forces was so critical to any plan to defeat an invasion. Counterattack is the surest form of defence. That was the thinking of the Wehrmacht, and it was very true. In the end, of course, our full-scale counterattack against the landings was late in being staged, and so the Allies had the chance to build up their strength in the coastal pockets that they captured on the first day. On the morning of 6th June 1944 D-Day around 3am I think, we were told that the enemy were landing paratroopers in the area, and that an aggressive parachute raid was in progress against our area. We had not noticed any parachutes, but we heard fighting to the East, and in the moonlight we saw a convoy of our troops in trucks moving that way. Everything was very confused. Captured German StuG III Ausf. F/8 Tank Destroyer. Notice the small cupola. About 6am, probably, there began to be a huge amount of explosions on the coast. We went to the edge of the woods and looked. We could not see the ocean itself, but we had a view down the escarpment, which was mined in places and had various resistance points built into it. It was about two kilometres down to the sea. In front of the escarpment, the poor old Static Infantry were in position. There were huge explosions down there, absolutely massive. We could see spouts of dust and earth rising up as high as a church tower down there. We said, 'God, the men on the beach are taking a terrible beating.' All we could do was watch. There were lines of fire in the air as well, which looked rather like arrows, and I recognised these from Russia as the 'Stalin Organ' type of rockets. These rockets were coming up from the sea and falling on the headland area. It was a real storm down there, with smoke and dust and the flames from explosions. The noise was very loud. We knew that this meant something important was happening. Slowly, this carpet of explosions began to move inland, up the escarpment Towards us. I know today that this meant that the Allies were on the beach and were bombarding further inland, but at the time, of course, we didn't know that the Allies had actually landed. All we saw was this dreadful wall of explosions coming up the slope, getting closer to us. We went back to our Stugs and we started the engines, and checked over the guns and ammunition in readiness. My role as the gunner required me to clean the optics on the gun sight perfectly, and I got the glass ready and applied a small amount of soap to the gun sight lens. This soap was to prevent the optic from steaming up with all the heat and fumes inside the Stug compartment. It was quite effective. It was a ritual of mine, in getting the gun ready for combat. We waited for some time with the engines running, while our commander was conferring with the Company command. Then, at last we were told to move out of the wood and take up our prepared positions at the top of the escarpment. These positions were points where we had practised our arcs of fire, and where we calculated that enemy tanks would approach to avoid the minefields. Our driver emplaced us in our position; our other two Stugs were on either side of us. As soon as we halted, I set the gun sight range for the field of fire we expected. Through my periscope, I also saw units of our infantry take up positions in slit trenches just in front of us, so we were firing over their heads. That officer told us that there were tanks moving up from the shore and that the attack was on a large scale, with dozens of tanks being placed on the beach by barges. It was about eight am when the first tank I saw was a remarkable sight! It was equipped with a rotating mechanism on the front, which was whirling around at an incredibly high speed. It was literally whipping up the ground on the escarpment, raising a big cloud of dust. The range was about 1,500 metres, which for my 75mm gun was quite manageable. The spinning drum on that tank was setting off mines in the minefield, and that was a problem for our plans, because if the other enemy tanks moved onto us across the minefield, we would have to change our positions to fire. Remember that the Stug was just a gun on tracks, it had no turret, and so aiming the gun had to be done chiefly by adjusting the direction of the hull left and right with the wheels, with the gunner only using a final few degrees at the end. As a defensive weapon it was excellent like a PAK bunker, but moving the damned thing around was not ideal. I certainly had not expected to see a mine-clearing tank like the Sherman Crab. I had no idea that such a machine had been invented. I found out after the war that the Allies had used it in Africa and Italy, but I had never seen such a thing on the Eastern Front. I must admit that I felt a kind of grudging admiration for the engineers who designed it, because it was an excellent idea. But all the same, I adjusted my optical gun sight onto the tank; that was my job. The Sherman Crab seemed to have no gun, and it was moving very slowly. My gun sight had a series of triangles inside the optic, depending on the range selected, and I used the hand controls to put the 1,500 metre triangle on this Sherman's turret. I can see the gun sight now as if it is still on my eye. And my hand on the firing lever. You squeezed it like this, you see. Firing that 75mm gun always made my face jump off the gun sight, because of the recoil! When I looked again, after firing, I saw that I had shot off a big piece of the armour from the side of the Sherman Crab's turret. This broken piece was rolling off across the land. The Sherman stopped, and then the drum and chains stopped turning. I shot again and I put the next round through the top of the hull. I saw this explode through the armour under the turret, because I could see a flash through the open part. I felt optimistic about turning back the enemy tanks now, because I thought the minefield was virtually impenetrable. It would take days to clear it properly, I knew that. Through the gun sight, I could see a number of other Shermans at the foot of the slope, and my commander fed me a commentary, telling me what was happening down there. The Shermans seemed to be hesitating, advancing and then moving back. I put my triangle on one of them, and fired as he came forward, but the shell deflected off his front plate. That caused all the tanks there to reverse, and we fired several rounds of high explosive to encourage them. I saw our grenadiers in the slit trenches cheering us on for our shooting. Then a big puff of smoke appeared in front of us; it was grey-blue smoke, and this smoke began to rise up into the sky. My Feldwebel (sergeant) cursed. He said this smoke was a marker flare, fired by one of the enemy tanks to mark our position. This meant that they had called for an air attack on us. He leaned out of the hatch and shouted to the infantry to extinguish the blue flare, but they were slow to respond, and other blue shells or flares burst close to us then. So this was how the Shermans did battle! They fired smoke shells to mark us out for the air force to attack. My mood changed again, with that sick feeling in my belly, because I knew that we had no real defence against the Allied air to ground attack aircraft we called Jabos. You know, those mood changes were so hard to take, the change from optimism to fear all the time. That is in the nature of battle, but it drained me, it exhausted me. Were we just going to sit and wait for the Jabos? If we left, we would be leaving the infantry. to their fate. I heard my commander shout 'Air attack!' And then hell on earth came to us in Normandy. I did not even see the planes. All I could see was their shadows moving across the slope, incredibly fast. That was all I could see through the gun sight. Then I heard a series of explosions, very loud and rapid, and I felt the Stug rocking around in the blast wave. There was a loud noise of shrapnel or something hitting our hull, really smashing into our metal plate, again and again. There was nothing we could do except brace ourselves and wait for this to stop. Through the periscope, I could see that the infantry trenches were badly hit, with smoke coming out of them, but I didn't realise how bad it was at that stage. I could also see several Shermans coming towards us behind the destroyed mine-clearing tank One of these had another rotating drum machine on its front, and it was obviously going to try to clear a pathway through the mines again. The mine-clearing Sherman Crab tank that we had destroyed was burning up fiercely, and throwing out a lot of smoke that obscured our view of the slopes. I saw the second mine-clearer come through this smoke, making a path around his destroyed friend and then go straightening up to steer towards us. I laid a shot on him, and fired, but the round didn't seem to penetrate the front of his hull. I think that the spinning chains on his drum were deflecting the trajectory of the shells. I don't know why that didn't happen with the first Sherman Crab tank, or maybe I was shooting poorly now, or possibly the gun bearings were damaged in the bombing. I fired again onto his turret, but I took the shot too hurriedly, and it clipped the side of his turret and deflected off. It's very difficult under those conditions to lay a shot precisely, with smoke and all the dust and debris that was coming out of the ground from his rotating cylinder machine. I was setting another shot onto him, because I was determined to stop him, when he pulled over to one side suddenly. Behind him, there was a queue of these damned Shermans, lined up as if they were waiting for a bus. I think there were four of them, lined up in the lane that the mine-clearer had made. They couldn't advance, but they were at a range of about 900 metres now, and that made me nervous, because even their short guns would start to be effective at that sort of range. Sure enough, the first one in line began firing at us, and the round deflected right off our sloping front armour. What a noise that made! The whole optic system shook, and I had to wait for it to steady before I could fire on him. I just got that shot away before he fired again, and I hit him low on the front plate. My commander congratulated me on that shot, because we saw it go through the front and then come straight out again from the top of the hull. That sometimes happens, you see, if the warhead ricochets around inside the compartment and hits a roof hatch or something. That damned warhead is going at a thousand kilometres per hour, and it's a piece of tungsten about the size of a big pebble. My God, the things it can do to the men inside the hull. Nothing can stop it, you see, and sometimes it just bursts out of the tank again. I also couldn't understand why our other two Stugs were not firing on these enemy panzers. We in my Stug seemed to be defending France all alone, single-handed. My commander told me to keep firing, keep firing as we were fully stocked with ammunition, and our gun was obviously effective against the Shermans. The next Sherman gunner, though, now, he was a good shot, an excellent shot. They should have made him the leading tank, really. He fired and hit us exactly under the gun mantle, just between the mantle and the hull front. Our Stug had the 'Saukopf (pig's head) type of mantle, which was a single piece of cast steel that deflected shots well. But there was a shot trap under the pig's head itself, which deflected an incoming round into the gun elevating system. All I felt was a huge crash as this Sherman round came right under where I was hunched on my seat. That was a moment of fear and panic, I can tell you. To be in a panzer when a round comes in is awful, sudden darkness, and smoke, the engine cuts out, and the crew men are shouting and cursing. It is a terrible few seconds after a panzer is hit. The fear of fire is always in your mind; should you open the hatch and jump, or is the panzer going to survive? My commander was very cool, and he told me to check the gun. I found that the gun was dislocated from its mounting and could not be aimed at all. The driver reported that the engine would not restart. There was also a strong smell of gasoline building up in the compartment. The danger in a panzer is that the fumes will ignite without warning. I was desperately relieved when the commander opened the hatch and told us to leave the vehicle. Of course, the Sherman gunner took no pity on us, and fired again as we were climbing out. This round deflected off the cupola, but pieces of metal hit my commander in the legs. We helped him off the vehicle and took cover behind the raised wall of the emplacement. That Sherman gunner systematically shot our Stug to pieces right in front of us. He shot rounds off the front plate, and then he blew it up with high explosive rounds. All the gasoline went up at once, so hot that it burned our skin and we had to run. The Sherman fired on us with his machine gun as we tried to run. I could not blame the Sherman gunner. We had just destroyed two of his comrades. But my overriding emotion was to get away from the shooting. We were now effectively unarmed, of course, as we had only our pistols left. As we were carrying our commander away, I saw what the Jabo bombing had done to our defensive positions. The other two Stugs were badly damaged, because the shrapnel had exploded through their engine covers. My crew managed to get down onto a slope behind us, facing inland, so that we had the ridge of the slope between us and the enemy. I can tell you that on the other side of this ridge, on the sheltered side, there was what looked like half the German army, all pressed down on the ground, waiting for orders. There were our other Stug crews, plus various infantry .